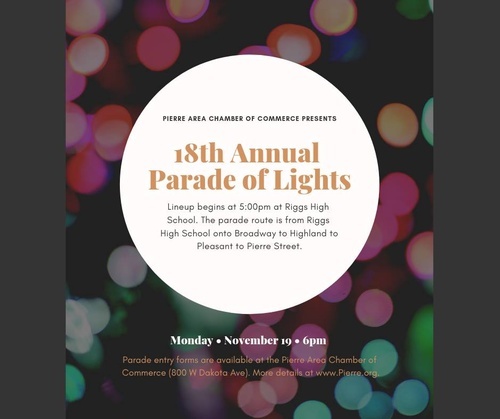 Help us ring in the holiday season by joining us for the 18th Annual Pierre Parade of Lights. The parade will be Monday night to kick off the holiday season. Registration forms are available at the chamber. Pre-registration requested through Monday, November 12th. Prizes will be awarded for 1st, 2nd and 3rd place entries, in addition to the Mayor's, Griswold and People's Choice awards. 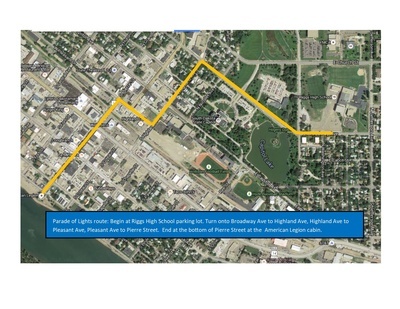 The parade will lineup at the Riggs High School parking lot and begin on Broadway Avenue. It will travel on Broadway to Highland Avenue, turn onto Highland, continue on Highland until turning onto Pleasant and then on to Pierre Street, finishing at the American Legion cabin. This is the same route as the Riggs High School homecoming parade. Donations welcome to offset costs. No charge to attend or be in the parade.